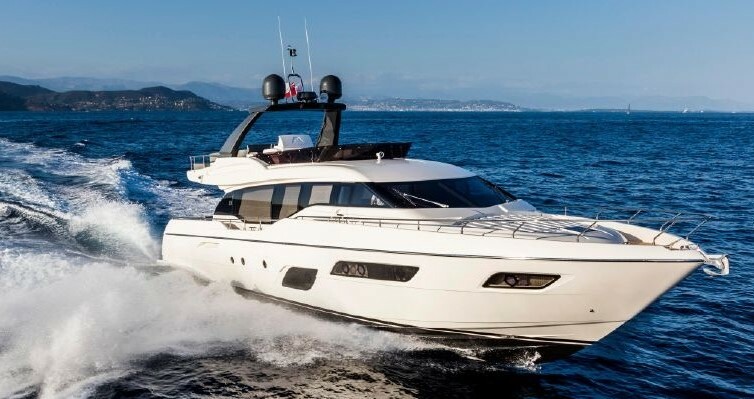 This FERRETTI 881 is a flybridge motor-yacht characterized by very spacious interiors, loads of options including zero-speed gyroscopic stabilizers and a wide array of tenders and water-toys. This FERRETTI 881 is family-owned and sailed in the Mediterranean in Summer, lying Florida and the Caribbean in winter. She has a permanent crew taking meticulous care of her and enjoyed the merits of private use only by her owners. The FERRETTI 881 provides very large and symmetrical living interiors, as well as comfortable accommodation for up to 10 guests sleeping in 4 staterooms. This fine example of the FERRETTI 881 series is a truly magnificent combination of contemporary yacht design, technology and performance offered in a yacht that has enjoyed unparalleled levels of maintenance and upkeep – viewings are highly recommended.